5/6/2018 The Acura Sports Car Challenge at Mid-Ohio was all about Acura Team Penske from the first practice session of the weekend on Friday through the checkered flag on Sunday's two-hour, 40-minute IMSA WeatherTech SportsCar Championship race. Every pre-race practice session ended with both of the team's Acura ARX-05 Daytona Prototype international (DPi) cars sitting 1-2 on the time charts. In Saturday's qualifying session, Helio Castroneves took the Motul Pole Award in the No. 7 Acura DPi, nipping teammate Dane Cameron in the No. 6 entry, who wound up second on the starting grid. And one Acura Team Penske DPi or the other led every one of the 125 laps completed in Sunday's race. In the end, Castroneves and co-driver Ricky Taylor were the ones to deliver the first WeatherTech Championship victory for Acura Team Penske, as Taylor crossed the stripe 8.464 seconds ahead of Cameron's No. 6 co-driver, Juan Pablo Montoya, to score a 1-2 sweep for the team. "I'm driving with one of the best organizations in the world, one of the best manufacturers in the world," Taylor said. "We visited Acura's factory for the NSX on Thursday and really got to see all that goes into these beautiful cars, and it really gives you a good sense of pride. "On top of that, to win for the first time back for Mr. Penske is outstanding and to start the month of May off for Helio with a win is awesome. There was so much pressure to get the car from him in the lead. He did an awesome job, so I had to fight to make his efforts worth it." It was Taylor's first WeatherTech Championship win since taking the Chevrolet Sports Car Classic on Detroit's Belle Isle circuit last June alongside his brother, Jordan Taylor, in the No. 10 Konica Minolta Cadillac DPi-V.R. It was the brothers' last of five consecutive wins together en route to the 2017 Prototype championship. It was Team Penske's first IMSA win in nearly 10 years, the last one coming at Utah Motorsports Campus near Salt Lake City, Utah, when Timo Bernhard and Romain Dumas won in the No. 7 Porsche RS Spyder. It was the first IMSA win for an Acura-branded prototype since the end of the 2009 season, when Gil de Ferran and Simon Pagenaud won at WeatherTech Raceway Laguna Seca in an Acura ARX-02 LMP1 car. And it was Castroneves' first IMSA win since taking the LMP2 class win in the Motul Petit Le Mans at Road Atlanta on Oct. 4, 2008. That win came alongside Ryan Briscoe, who co-drove to a fifth-place finish in the GT Le Mans class on Sunday with Richard Westbrook in the No. 67 Ford Chip Ganassi Racing Ford GT. "That was great," Castroneves said. "It started from the beginning, actually the front row, the No. 7 and the No. 6 were right there. Dane was really strong and put a lot of pressure on me, but in the end, it was a long race. I was taking it easy and making sure we made the numbers that we needed to make, and then I left it to my teammate here, Ricky, and what an incredible job he did. "Not only making room and trying to find places around the track to pass people and keep cool, which that's the toughest part. I was biting my nails back there, but in the end of the day, he brought it home in phenomenal style. I'm so glad to be part of this organization, it's great for myself and Ricky to give the No. 1 victory for Acura and hopefully this is just the beginning." Castroneves and Taylor combined to lead a race-high 87 laps. The other 38 laps were led by Cameron and Montoya in the No. 7 Acura. It was the second time this season that a Prototype team scored a 1-2 sweep, with the other coming in January's Rolex 24 At Daytona when Action Express Racing went 1-2 with its No. 5 and No. 31 Cadillacs. While Acura Team Penske was dominant throughout the weekend, they did face down a stiff challenge from both Mazda Team Joest DPis to earn the victory. Both the No. 55 Mazda RT24-P of Jonathan Bomarito and Spencer Pigot and the No. 77 of Oliver Jarvis and Tristan Nunez challenged the pair of Acura DPis throughout the first half of the race. The No. 55 car's bid for the victory came to an end shortly after Pigot took over in the seat just past the halfway point in the race when the car's suspension was damaged in side-to-side contact with a GT car. Nunez, however, kept up the fight and brought the No. 77 Mazda home in third place. It was the first podium result for the new-for-2018 Mazda Team Joest operation and was the first Prototype podium for Mazda since a third-place run in the Sahlen's Six Hours of The Glen last June. Prototype points leaders Filipe Albuquerque and Joao Barbosa finished fourth in the No. 5 Mustang Sampling Cadillac DPi-V.R. Jordan Taylor and Renger van der Zande completed the top five in the No. 10 Konica Minolta Cadillac DPi-V.R. The entire race was run without a full-course caution. Next up for the WeatherTech Championship is the Chevrolet Sports Car Classic in Detroit on Saturday, June 2. The 100-minute race will feature the Prototype and GT Daytona classes only. 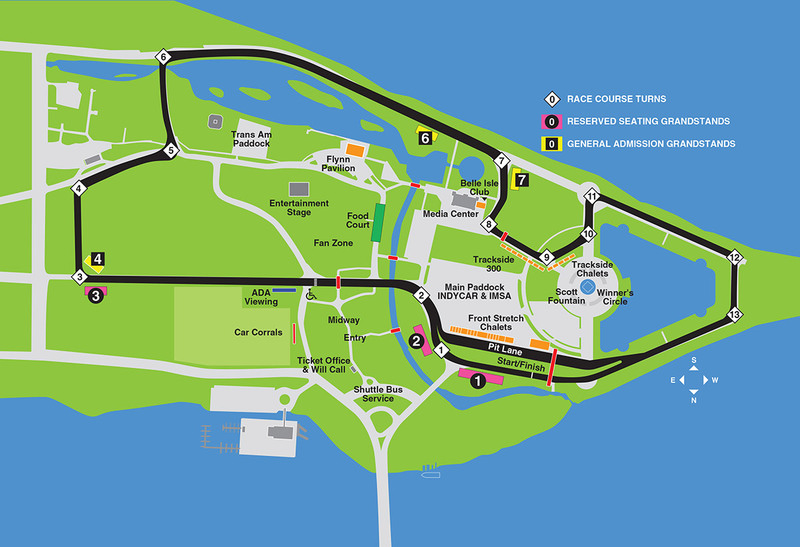 Tickets are available now at DetroitGP.com.